As the oldest permanent American settlement on the Puget Sound, the city of Tumwater has been a cornerstone of the region since the mid 1800s, creating leaders and passionate community members who helped shape the South Sound and the State of Washington. Today, a new generation of leaders is emerging to ensure that future generations of Tumwater residents have a fantastic city to live in, full of amazing parks, great schools and new businesses to, stimulate the local economy. Nicole Hill, a proud resident and member of the Tumwater City Council, is one of these leaders. 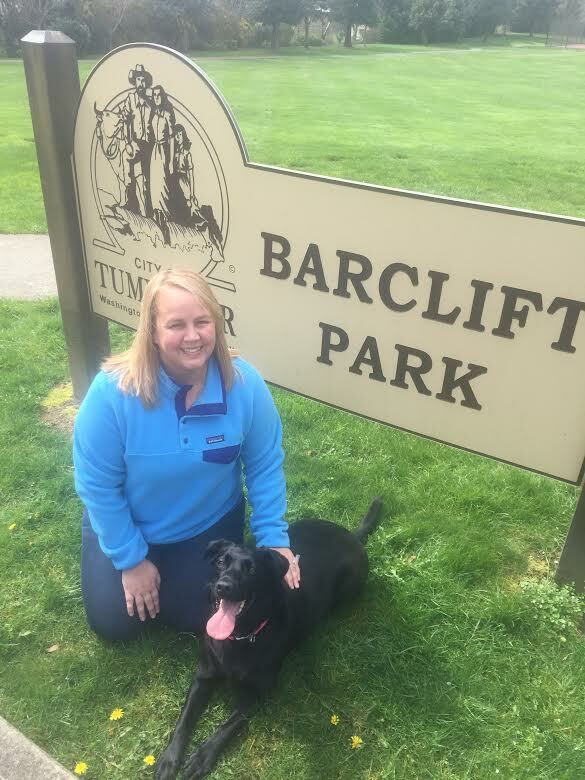 Nicole Hill is often found at Tumwater parks, enjoying time with her dog Izzy. Photo courtesy: Nicole Hill. Nicole is like many residents around the region, discovering the beauty of the Pacific Northwest as an adult. Growing up in a small town in Indiana, she found herself relocating to the Puget Sound in 2006 after graduating from college and landing a series of great gigs working on behalf of public lands and environmental issues. Her first job found her on the Olympic Peninsula working for the Cascade Land Conservancy, Washington’s largest independent land conservation and stewardship organization. While initially living in Seattle, she soon found herself longing for small town life. That feeling of home and happiness, mixed with her interest in politics, inspired Nicole to do more for her community. Whether it was working at her job for the Nisqually Land Trust, helping with local campaigns around the region or being a vocal advocate for the environment, her passion and dedication to the community soon caught the eye of the political movers and shakers in the region. Within a few years of moving to Tumwater, she became one of the most dynamic women in the region, representing the city as a council member. 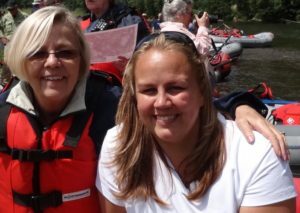 Nicole Hill is an avid outdoors enthusiast, something she shares with her mother. Photo courtesy: Nicole Hill. Since being appointed, Nicole has been a vocal leader in many aspects of the community, ranging from the brewery and the parks, to the future Capitol Boulevard plan and bringing a Toyota dealership to town. She has also been a passionate supporter of the numerous volunteer programs around the community. 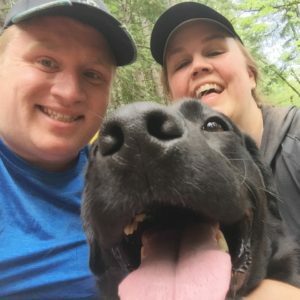 Nicole, Nick and Izzy love to get out and explore, with local parks bringing joy to this Tumwater family. Photo courtesy: Nicole Hill. Nicole has a lot to be proud of, thanks to her work for the environment and the city. Each week, she spends more than 60 hours working her day job and as a city council member. When pressed on her happiest achievement outside of politics, she brings up her work with the Nisqually Land Trust as part of the team that purchased the old farm in Ohop Valley. The farm had been operating in the valley since Washington achieved statehood, but the owner knew that dairy farming was dying and the best thing to do was to help restore the area as salmon habitat. Recently, the Nisqually Land Trust gave the old farm buildings to the Eatonville School District for STEM classes, helping maintain the connection to culture, history and nature for future generations. Make no mistake: Nicole is a political person through and through. She grew up in a union family, where members of her family were UAW workers at GM and Chrysler, and she has been fighting for the future of Tumwater every day. However, her job serving the community is not all that defines her. Besides being a dedicated environmentalist, she is a vigilant Seattle Sounders fan and a lover of country music. She is also a staunch supporter of Tumwater Artesian Brewfest, telling ThurstonTalk she thinks it is the community’s best event.